Brazil Visas Expedited as Fast as in 5 Days! Brazil Visas are required for all US Citizens and many foreign nationals prior to leaving the United States. Using our Brazil visa service, we can personally guide you through the Brazil visa application and obtain your Brazil visa in time for your trip! Easy. We provide personal service every step of the Brazil Visa process. Fast. Expedited Brazil visa services are available. Dependable. Over 100,000 Brazil visas obtained since 1992. For travel to Brazil for tourist or business purposes for citizens of the United States, Canada, Japan and Australia. Visa for Flight and Maritime Crew functions. For Students pursuing technical short-term studies (at least 15 hours of classes per week), students pursuing undergraduate, graduate or post-graduate academic or theological studies, or unpaid student interns. For work purposes, approved by the Brazilian Ministry of Labor. You must provide 1 electronic passport photo. 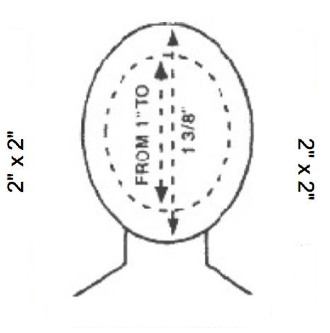 This passport photo must match the requirements of a standard US passport photo. Photo should be emailed in JPEG format and should be as clear as possible. Scanned photos that appear pixelated or blurry will be rejected by the Brazilian consulate for visa purposes. Your photos must follow these guidelines - HERE. Please provide one clear, color copy of your passport's information page. JPEG format is recommended. Note: When signing any documents pertaining to this Brazil visa, your signature should appear as it does in your passport. If your signature has changed, it's best to use your old signature so that all documents match. Please complete this short one page questionnaire - Brazil E-visa Questionnaire. Note: If your answer to any of the questions form #3-11 is "Yes", you will be denied an Brazil e-visa. 1. Copy of both parent's passports. Passports must be signed. 2. Scan of both parent's passport style photos. 4. Minor Authorization Form - click HERE. 6. Signatures - Note to parents: All documents pertaining to this Brazil Visa application that you sign, must match your passport. If your signature has changed it is in your best interest to sign using the signature as it appears in your passport. 7. Statement of Non-Brazilian Citizenship - if the parent's of a minor were born in Brazil or might have had Brazilian citizenship at some time in the past, they must complete this form to verify that the child never was issued a Brazilian birth certificate and therefore does not have Brazilian citizenship - click HERE. Please note: Children endorsed in their parent's passport are not eligible for the e-visa. 1. Clear scanned color copy of your passport information page. 2. Scanned copy of your passport photo. 3. Completed Brazil E-visa Questionnaire. Copy of both parent's passports. Minor Authorization Form - click HERE. How long does it take to obtain a Brazil visa? What is the difference between a passport and a Brazil visa? Do I need a Brazil visa?